You know this thing about Sonic Boom Games? The Sonic Boom Games category is one of the best Cartoon Network Games categories you will be able to find here on www.cute-games.com. You will have a lot of fun with Sonic, Tails, Amy and the rest of the gang for sure. Don't believe us? Start playing any of the Sonic Boom Games here, and you will see that we are right! In Sonic Boom Games you can find 5 games that we've published for these kids and childrens that are interested to play Sonic Boom Games, this game gategory have been created on 21.06.2016. These games with Sonic Boom Games have been voted 1 times and the avarage of vote is 5.00 stars. We advice you to play the last flash game from Sonic Boom Games, Sonic Boom Hidden Letters that have been published on 20.02.2017 09:01. Sonic Boom Hidden Letters its a part of Sonic Boom Games category and until now its played 895 times. Try it now on Cute-Games.com! 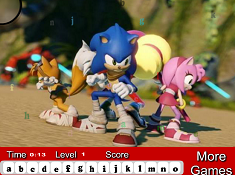 If your like the Sonic Boom Hidden Letters game you can write a comment in the game page. Recommend this game to your friends if you like it! 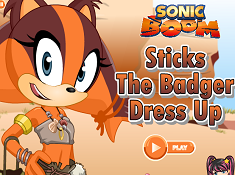 Sticks The Badger Dress Up its a part of Sonic Boom Games category and until now its played 2607 times. Try it now on Cute-Games.com! If your like the Sticks The Badger Dress Up game you can write a comment in the game page. Recommend this game to your friends if you like it! 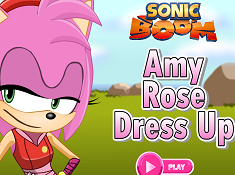 Sonic Boom Amy Rose Dress Up its a part of Sonic Boom Games category and until now its played 4000 times. Try it now on Cute-Games.com! If your like the Sonic Boom Amy Rose Dress Up game you can write a comment in the game page. Recommend this game to your friends if you like it! Sonic Boom 6 Diff its a part of Sonic Boom Games category and until now its played 1299 times. Try it now on Cute-Games.com! 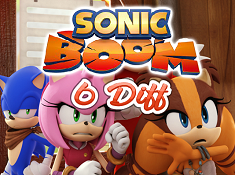 If your like the Sonic Boom 6 Diff game you can write a comment in the game page. Recommend this game to your friends if you like it! Sonic Boom Link N Smash its a part of Sonic Boom Games category and until now its played 1074 times. Try it now on Cute-Games.com! If your like the Sonic Boom Link N Smash game you can write a comment in the game page. Recommend this game to your friends if you like it! Find More About Sonic Boom Games! One of the longest franchises of video games is the Sonic one, and Sonic is not limited to video games only, as this franchise has expanded to cartoon shows, comic books, animated movies and other media, and year by year, Sonic has become more and more known all around the world. In 2014, Sonic Boom, which is the fifth animated series based on this franchise started it's run on Cartoon Network, and in the fall of 2016, a second season is going to start airing, and we can't wait for it. In preparation for it, our team has decided that we really have to create the Sonic Boom Games category here on our website, because there are already a good number of games based on it available on the internet, and we really want to be able to add them on our website also. There is also the fact that since the series is coming back to tv, those who will watch it will search more for Sonic Boom Games, and on www.cute-games.com, we want to be able to offer them all, for free, all the time. There is no better place for you to play these awesome games, as www.cute-games.com is the best website ever, where all your favorite games are added daily, so you can never get bored browsing the website. Now, we are going to use the remaining space of this description to tell you more about the show and it's characters, because we want those who are not up to date with it to be able to find useful information right here, without even leaving the website, and who knows, maybe even convince them to play the games here. 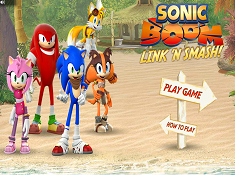 Of course, after that, we are going to talk about the Sonic Boom Games on the page, which you can go right ahead and start playing if you are already watching Sonic Boom, and know what there is to know about it. Sonic, Tails, Amy, Knuckles, who you may already know from the previous incarnations in the different tv shows already aired, together with a brand new character only appearing in Sonic Boom, called Sticks, are back to their usual adventures on Bygone Island, which is the place the setting of the show takes place. Bygone Island is a place where something is always happening, and this team of heroes has to defeat the island and it's residents from their main enemy, Doctor Eggman, who has all kinds of robotic creations at his disposal, but also all sorts of other threats and enemies. The team is always going to do their best to stop evil, and they will each use their individual skills to work together, find the best solution to deal with the situation, and save the day. The spirit of the show is going to carry on in the Sonic Boom Games also, where you will have a lot of fun for sure. Sonic remains the leader of the team, and he is a blue hedgehog who has super speed. He always does his best to be a hero, even if he is reckless and inpatient at times. Amy Rose is a female hedgehog, a love interest for Sonic, as she likes him in this show also. Unlike the rest of the team, she is the most level-headed. Knuckles is the muscles of the team, as he is the strongest physically, and he is also pretty clueless about the things around him. Tails is a fox with two tails, who acts as the mechanic and expert in technology, and also as Sonic's sidekick, just like in all the other incarnations. Now, let's talk about Sticks, which is the most recent addition to the group. She wields a boomerang and she comes from the jungle, which can be seen many times, as she is the most wild member of the team. She can't speak properly, but she often times has great solutions to problems, which the other guys would never think of. With a bunch of characters like these, we are pretty sure that you will never get bored playing Sonic Boom Games on www.cute-games.com, especially with the fun games found here. What kind of games? In the Sonic Boom Games category you will be able to find interesting bejeweled games, like Link 'N Smash, dress up games with Amy and Sticks, which girls will surely enjoy, or skill and patience games like differences games or memory games. We hope that you will find all the Sonic Boom Games on this page to be very enjoyable, and you will play them all and have a great time. After you are done with the Sonic Boom Games, check out all the other great categories spread around our website, where you will find many fun games for you to play, and you will have a great time, no doubt!